You are invited to join Mrs. Julie Thompson, Executive Director of Elementary and Scott Bolton, Interim Executive Director of Human Resources, for Chilhowee Intermediate’s New Principal Search Community Input Meeting. You will learn more about the principal-hiring process and provide input on the characteristics and attributes you would like to see in our new Chilhowee leader for the 2019-20 school year. Want to become involved in your child’s school? Want to make a positive difference in your community? Consider becomming a Substitute Teacher with Knox County Schools! Click Here for More Informtion! If you haven’t joined PTA yet, please do! The dues are $5.00. Everyone working together can achieve so much more and we need to support PTA. Membership is one of the fundraisers! There are special incentives for Students who get a family member to join! 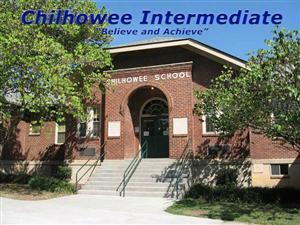 Welcome to Chilhowee Intermediate School's Positive Behavioral Intervention and Supports (PBIS) Our school-wide positive behavior interventions and supports system help students to learn the behavior expectations for various areas of our school. We hope that these clear and concise expectations will improve the school climate and help teaching and learning for all. Students are reviewing Hallway and Common Area expectations this week! Grades 3, 4, and 5 Class Supplies for August 2018! Congratulations to Eric Aguilar, Third Grade Teacher! Congratulations to Amy Trull, P.E. Teacher! Check it out! These eBooks are available on any internet-connected device: laptops, smart phones, iPads, Kindle Fire tablets, etc. To access these eBooks, go to https://knoxschools.mackinvia.com/ Select your school from the drop-down menu. The username will be your child’s student ID number, which starts with the letter s and is followed by a six or seven digit number. The password will be your child’s Active Directory password, which is the same password they may use for other schoolbased online services such as Canvas, Google Drive, or to log on to Chromebooks. Click Here for more about Mackin Via!